Welcome to Larke Lab Kennels! Welcome to labkennels.com, home of Larke Lab Kennels of Williamsburg, PA. We breed and raise healthy, beautiful, friendly and award-winning black, chocolate and yellow Labrador Retrievers. Our goal is to help you find the perfect lab that you've always wanted. We are licensed kennel family owned and operated by Larry and Linda Mock. Our love for labs started in August of 1988 with the purchase of our first chocolate lab named Kody. 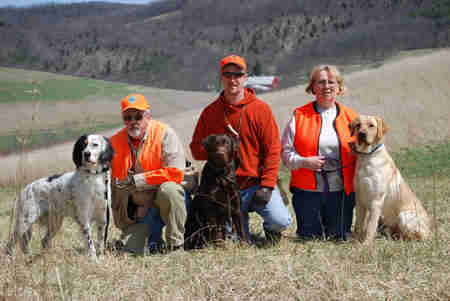 With no formal training, Kody introduced us to upland bird hunting. That was the start of our love for labs. Our kennel is nestled between the mountains of Central Pennsylvania near Altoona, Pa. At Larke Lab Kennels we breed and raise labrador retrievers. Our Labs are AKC registered and all of our adult dogs have been OFA for hips and elbows (excellent or good) and CERF on eyes. Larke Lab Kennels welcomes visitors by appointment! © 2015-2017 Larke Lab Kennels. All rights reserved. Developed by TylerTek.